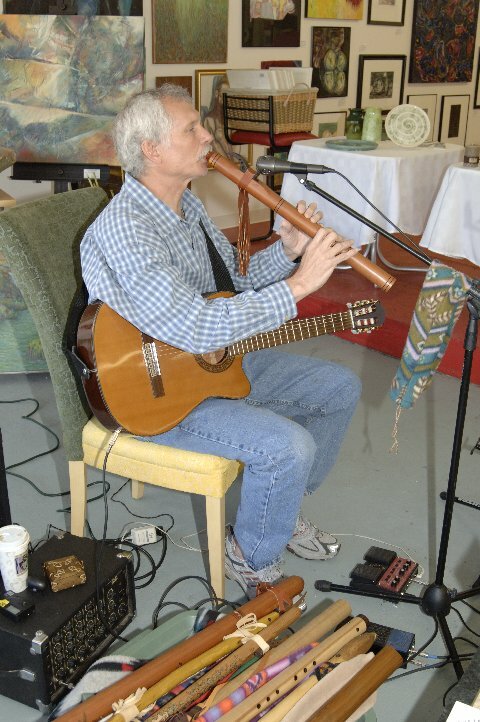 Michael Murphy has recorded five independent albums; the most recent two (Trail of Tears and Peace) feature his recent interest in meditative, instrumental music. Along with his acalimed guitar and flute work on these albums, he is a very expirienced singer songwriter, and has been repeatedly invited to participate in songwriting contests and workshops at regional folk festivals. His music often discusses socially conscious themes, such as civil rights, peace, family values, and the environment, and in the tradition of American folk music, he often picks up his harmonica or tickles the piano keys. His instrumental music is appropriate for weddings, traditional rites and even corporate functions, and he can accomidate himself to situations where an ethnic, traditional, or american folk sound is desired. The easiest way to see Michael play is to come to McFosters (38th and Farnam) on Monday evenings from 7-10 PM. You may also find him at concert halls, art and music festivals, colleges and coffee shops. He keeps his calendar regularly updated, and you can contact him at his email address. Michael is very well respected in the Midwest, and has spent thirty years travelling across the country, sharing his music and stories. He also teaches various clinics and workshops in Native American flute and regularly teaches as an adjunct at Metropolitan Community College in Omaha. Please feel free to explore his site, read through the published reviews and his journal, and take a look at his calendar and art gallery.